Until the end of July, everyone can watch A.D. 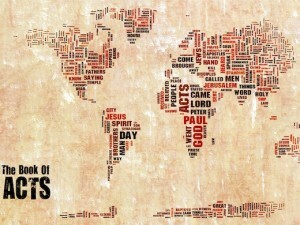 The Bible Continues – and what better way to engage the Bible but through a visual representation? A.D. 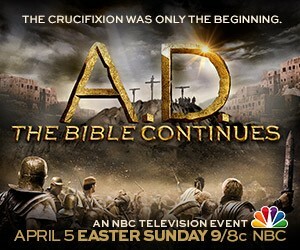 The Bible Continues (NBC) is a dramatization of the first ten chapters of Acts, and starts with Jesus’ crucifixion and resurrection. The episodes are produced by Roma Downey (Touched by an Angel), Mark Burnett, and Richard Bedser, and is a sequel to their 2013 series The Bible. Sophia Institute Press has published two books alongside this series: A.D. Catholic Viewer’s Guide by Veronica Burchard and Ministers and Martyrs: The Ultimate Catholic Guide to the Apostolic Age by Mike Aquilina. A.D. Catholic Viewer’s Guide is enjoyable for group and personal study, as well as for watching the program. The book is ordered by the 12 episodes and provides a nice visual breakdown of the timelines, maps, characters, and terms. The reader is also given Scripture selections to help have a fuller understanding and context, which I really appreciated. Reading the text is as important as understanding the text and the history surrounding it, even if the words transcend time. I really like the discussion questions — to often, we’re not asking the right questions. We’re absorbing and not thinking differently, so as to more fully understand. There are also Catholic take-aways, which is a good jumping off point for engaging the Catechism, if the reader so chooses. There are also prayers to help this guide more pointedly help our spiritual life. The background reading in this book is provided by Mike Aquilina, the author of the second book – Ministers and Martyrs. If the reader is looking for a more intellectual understanding of Acts and this series, Aquilina is the writer to give it to you. His writing is accessible for people of all backgrounds to understand, and it is important for people to read, especially to understand the Church’s beginning. Aquiline writes, “The God Peter preached was not a solitary being, but an eternal communion. The God revealed on Pentecost was interpersonal. Only of such a deity could the Apostles say: “God is love” (1 John 4:8,16). It is in the very title of the book that we readers can grasp our true calling as Christians: martyrs and ministers. Aquiline discussing the holiness of these basic roles, and in their simplest form, the kind of death both would experience by witnessing to the faith. We do not live in a country where Christianity is illegal, but we do live in a world where standing with Christ is as unacceptable today as it was in the early Church. Christianity is a radical love story with the most ordinary of people giving their lives to Christ in extraordinary ways. 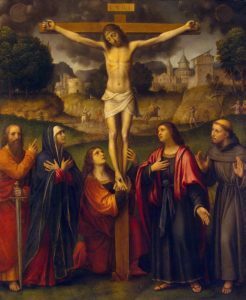 The early Church faced many challenges that we continue to face today, including gnosticism, and the separation many of us feel between members of our own faith! Aquilina writes, “Paul considered God’s eternal oneness to be the source and model of the unity of Christians. The Church’s communion is a share in the eternal bond of the Father, the Son, and the Holy Spirit. Thus, division in the Church is an affront to God. It is a desecration of the divine image.” Just as we must love one another as we love ourselves, as we are made in the image of God. Cardinal Donald Wuerl, in his forward of this book, writes, “It is good for us to go back, often, to study the lives of the early Christians. 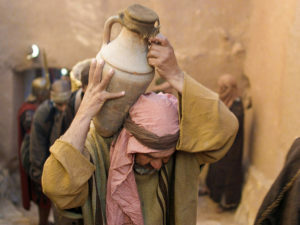 Their faith had a freshness, a sense of surprises, that we can learn and recover for ourselves. God, after all, is as youthful as ever; Jesus still has the capacity to suddenly astonish people who think they know him well.” These books are treasure troves of information, and worthy reading companions to both the television series and the book of Acts itself. DISCLAIMER: This set was sent to me by Sophia Institute Press for my honest review. Thanks, the series was great, but really, card wuerl? Completely silent in the face of a president who attacked Christians at the White House Easter celebration….. Perhaps his eminence forgot the meaning of the crimson & worries too much about the silk. I had high hopes for the series but was severely disappointed to say the least. Leaving aside poor acting, the script was seriously deficient in terms of being historical. On many points AD simply ignored history and made things up. 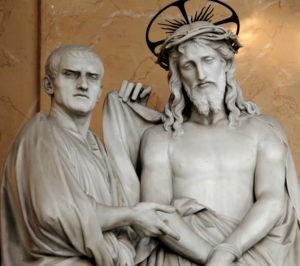 The religious message was buried under a soap-opera script centering on made-up interactions in the households of Pontius Pilate and Caiaphas.